A teenager has been arrested over the fatal stabbing of a 16-year-old boy in a Birmingham park. Abdullah Muhammad died in Sara Park in Small Heath on 20 February. He had been stabbed in the back and chest. 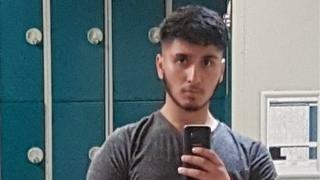 A 17-year-old boy from Birmingham was arrested at an address in Rugby on Friday night in connection with the attack, West Midlands Police said. He is in custody. Two men have already been charged with murdering the student. Amari Robinson from Birmingham is charged with murder and two counts of robbery. The 20-year-old, also known as Amari Tullock, is due in court on Monday. Demille Innis, 19, from Walsall, has already appeared in court.